All ECD members work towards the same goal - to be the best locally and to be the preferred full-range wholesaler in their market. Very successful first six months of 2016: Continued success for Eurogast! Top Food Group. RESTO EXPO (Resto-Frit Exhibition) The annual fair for the catering industry at the end of March. In the middle of January the first stone for a new building was laid symbolically on the construction site next to the Service-Bund headquarters in Lübeck. 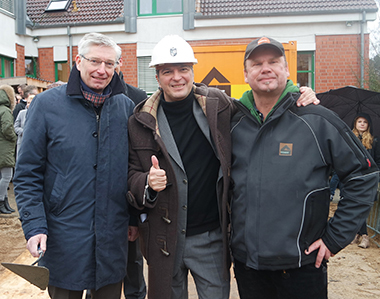 Managing Director Ulfert Zöllner celebrated the groundbreaking ceremony together with guests and staff. “Because the Service-Bund group is growing very fast, the construction of a new central administration building is necessary. In 1993 we started with a small staff. Today the team includes over 100 people, so we need additional capacity”, said Ulfert Zöllner. The growth of Service-Bund is also clear from the sales figures: At the end of 2015 external sales of all members added up to one billion euros; the turnover of the Lübeck headquarters topped 530 million euros. The duties of the 30 partners of Service-Bund were more extensive in earlier years: today the marketing, sales, controlling, training, quality assurance and the entire financial management of the whole group are now centralised at Service-Bund. That is why a new office complex is necessary to bring together all departments as well as the colleagues in Service-Bund National and in Computer-Centrum Nord, an affiliated company focused on IT. By the end of the year all construction will be completed, so the staff will move into the new building in the first quarter of 2017. Ulfert Zöllner, Managing director of Service-Bund, celebrated the groundbreaking ceremony together with guests and staff. Centre: Ulfert Zöllner. Left: Jan-Friedrich Schütt (Managing Director, Friedrich Schütt & Sohn Baugesellschaft mbH & Co. KG). Right: Kai Krüger (Foreman, Friedrich Schütt & Sohn Baugesellschaft mbH & Co. KG). Friedrich Schütt & Sohn Baugesellschaft mbH & Co. KG is the building company.